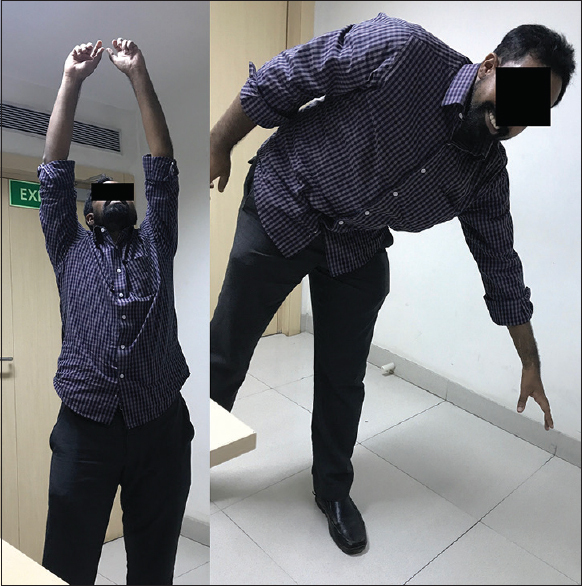 Elbow dislocation closely follows shoulder dislocation as being the second most common dislocation in adults., Elbow dislocation may be simple or complex. Simple is dislocation without fracture, just a capsuloligamentous injury, whereas complex dislocation consists of fracture dislocation of the elbow. Radiocarpal fracture dislocation is a rare high-energy injury which may be seen as a result of severe crush or rotation injury to the carpal bones due to either fall from a height, high-speed motor accidents or industrial accident. Here, we present a case report of elbow dislocation along with radiocarpal fracture dislocation. A 31-year-old male came to the hospital with complaints of pain and deformity in the left elbow and wrist. The patient gave a history of falling from a stool while changing a light bulb. On examination, the left elbow was deformed, and there was swelling seen on the left wrist along with the deformity. There was tenderness elicited on both the elbow and the wrist. Elbow and wrist range of motion were painful and restricted. There was no distal neurovascular deficit. X-rays showed left elbow posteromedial dislocation along with left radiocarpal fracture dislocation [Figure 1]. Both the elbow and the wrist were reduced under general anesthesia immediately. Gentle traction was given on the proximal forearm in flexion thereby reducing the elbow; the wrist was then reduced with traction; splint was given in the form of above elbow plaster slab; and the patient was admitted. Postreduction the elbow was found to be stable and was not subluxating. After 2 days, the swelling in the distal radius reduced, and the patient was taken up for open reduction and internal fixation (ORIF) of distal-end radius with volar plating. A volar incision was given over the distal-end radius, and dissection was done in between the flexor carpi radialis and the radial artery. Flexor pollicis longus tendon was identified and then retracted medially. Subperiosteal dissection of the pronator quadratus was done, and the fracture was visualized and reduced under vision and C-arm. The plate was applied and fixed with screws [Figure 2]. In the postoperative period above elbow plaster slab was applied for 4 weeks. The range of movement was started after that, and the patient was allowed full function of the limb after 8 weeks. There was no complication in the intraoperative or the postoperative period. The distal radius fracture united, and there was no episode of any redislocation of the elbow. 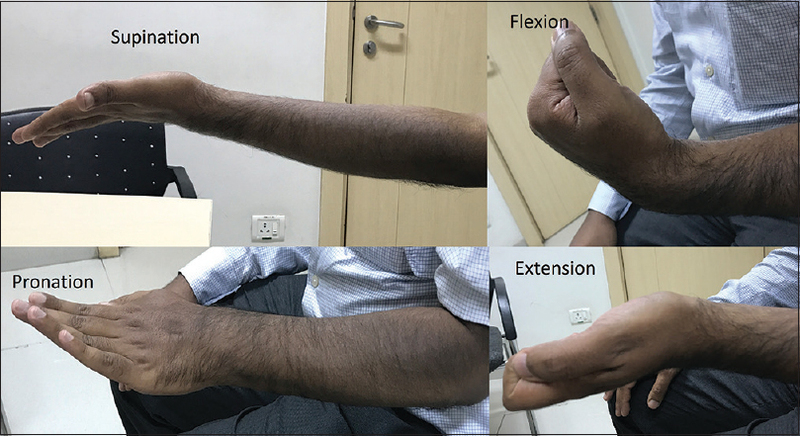 At 3-month postoperative follow-up period, the patient attained 70° of flexion of the wrist and 25° of extension at the wrist. The wrist showed full supination and pronation [Figure 3]. The flexion and extension increased at 6-month postoperative with a deficit of 20° of extension of the wrist. X-rays showed healed fracture with the articular surface maintained and the plate in situ [Figure 4]. The elbow joint is one of the most stable joints in the body. Elbow dislocation is generally associated with fractures of the distal humerus or the proximal radius or ulnar. Elbow dislocation along with shaft radius or ulnar fracture has also been described in the literature. The association of the elbow dislocation with radiocarpal fracture dislocation is rare. The cases reported like this are in the pediatric age group.,,,, The mechanism of injury for such an injury may be either due to a single impact due to falling from a height on an outstretched hand or double impact first on the ground causing the radiocarpal fracture dislocation and the second impact causing the ulnohumeral dislocation. In this case, the mechanism was the initial one. The force on the outstretched hand caused the fracture dislocation of the radiocarpal joints whereas the massive force on a hyperextended elbow caused the posterior dislocation of the ulnohumeral joint [Figure 5]. The elbow joint can be easily reduced under sedation, and in this case, it was found to be stable. For the fracture dislocation of the radiocarpal joint, ORIF was done to encourage early mobilization. The final union result was good and without any complications. Elbow dislocation with ipsilateral radiocarpal fracture dislocation is rare. The mechanism of injury should be kept in mind to look for such associated injuries. Kuhn MA, Ross G. Acute elbow dislocations. Orthop Clin North Am 2008;39:155-61. Parsons BO, Ramsey ML. Acute elbow dislocations in athletes. Clin Sports Med 2010;29:599-609. Mezera K, Hotchkiss RN. Fractures and dislocations of the elbow. Rockwood and Green's Fractures in Adults. Bucholz RW, Heckman JD, Court-Brown CM (ed): Lippincott Williams & Wilkins, Philadelphia; 2001;1:921-52. Dumontier C, Meyer zu Reckendorf G, Sautet A, Lenoble E, Saffar P, Allieu Y. Radiocarpal dislocations: Classification and proposal for treatment. A review of twenty-seven cases. J Bone Joint Surg Am 2001;83-A: 212-8. Ahmad R, Ahmed SM, Annamalai S, Case R. Open dislocation of the elbow with ipsilateral fracture of the radial head and distal radius: A rare combination without vascular injury. Emerg Med J 2007;24:860. Meena S, Trikha V, Kumar R, Saini P, Sambharia AK. Elbow dislocation with ipsilateral distal radius fracture. J Nat Sci Biol Med 2013;4:479-81. Nanno M, Sawaizumi T, Ito H. Transverse divergent dislocation of the elbow with ipsilateral distal radius fracture in a child. J Orthop Trauma 2007;21:145-9. Hung SC, Huang CK, Chiang CC, Chen TH, Chen WM, Lo WH. 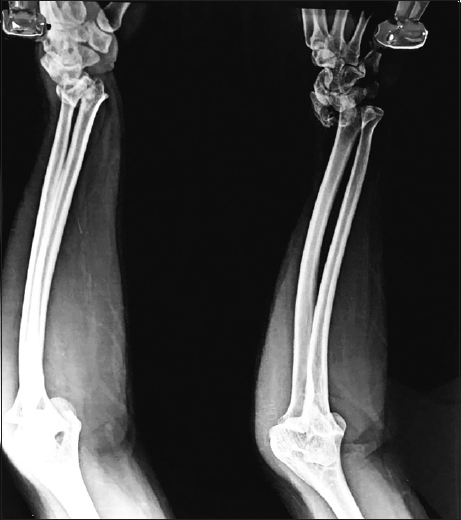 Monteggia type I equivalent lesion: Diaphyseal ulna and radius fractures with a posterior elbow dislocation in an adult. Arch Orthop Trauma Surg 2003;123:311-3. Ring D, Jupiter JB. Current concepts review-fracture-dislocation of the elbow. J Bone Joint Surg Am 1998;80:566-80. Batra S, Andrew JG. Ipsilateral compound distal radius fracture with missed elbow dislocation. A rare injury pattern. Eur J Emerg Med 2007;14:363-4. Soon JC, Kumar VP, Satkunanartham K. Elbow dislocation with ipsilateral radial shaft fracture. An unusual outcome. Clin Orthop Relat Res 1996;329:212-5. Vaishya R, Krishnan M, Vijay V, Agarwal AK. 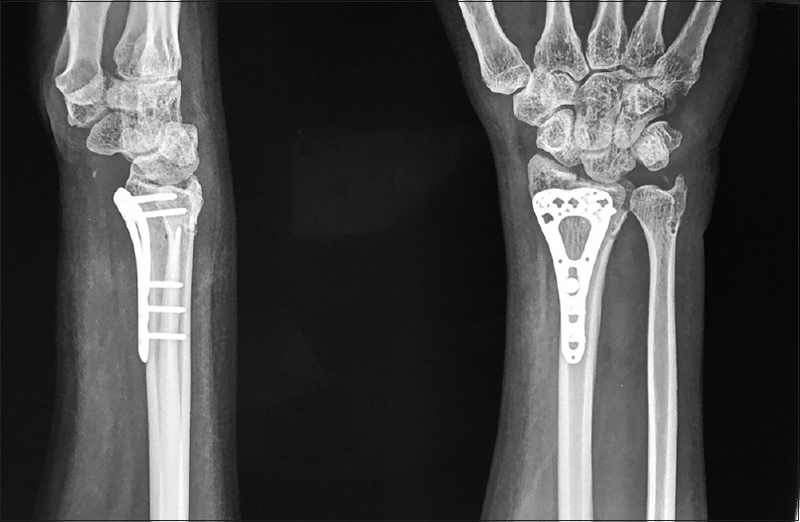 A rare combination of complex elbow dislocation and distal radial fracture in adults. Cureus 2016;8:e868. doi: 10.7759/cureus.868.